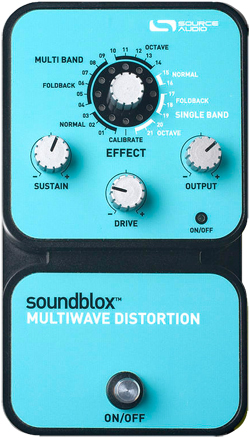 Guitar players love distortion. No big secret, really. From the time we start playing we are pretty much issued a distortion pedal of some kind right out of the gate and we proceed from there. By the time I was 13, I had my brown Ross distortion plugged into my solid state Gretsch amp and pretty much blistered my Mom’s paint for a few hours every day. These days, distortion and overdrive pedals have become much more of a gourmet affair, with a seemingly limitless array of choices and price points to consider when seeking a way to dirty up one’s tone. As always, however, your humble Gear Vault roving reporter and completely out-of-control guitar obsessive, that being me, has come to your rescue yet again with a live report and demo of two of the hottest new dirt boxes around. My good friend Pat Davey, owner of Goodtime Music in Streamwood, Illinois (just outside of Chicago), allowed me and the Gear Vault documentary film crew to come into the shop after hours to try out the new MXR Custom Badass ’78 Distortion and the new Way Huge Green Rhino Overdrive Mk. II. Both pedals offer players a great dirty tone, but are very different from each other in their overall flavors. The MXR Custom Badass ’78 Distortion is the first offering in what will be an entire line of Custom Badass pedals. What they are, really, are factory pre-modded hot rod pedals designed to give the types of sounds players are getting by modifying older pedals. The ’78 Distortion does not disappoint in the hot-rodding department, to be sure, and can pretty much turn any clean amp into fire-breathing rock machine. It is pretty much a stack-in-a-box and delivers convincing rock and metal distortion tones easily and effectively. Controls are Distortion, Output, and Tone, with an additional Crunch button that switches between hard and soft clip diode and LED tones. Amp-like old school dirt abounds when the ’78 turns on yet it remains articulate and reasonably defined and does not turn to mush. It is a great choice for those seeking the harder side of classic rock. The Way Huge Green Rhino Mk II, on the other hand, is a beast of a different color. The Rhino is a true overdrive, not a distortion pedal, and offers less gain than the MXR, is warmer and less aggressive and offers quick access to wonderful low- and medium gain sounds. It also has controls for Drive, Tone, and Volume, but also sports a 100Hz EQ knob that can cut or boost low frequencies by 12dB. In addition, there is a Curve control that allows players to work on the corners of their guitar sound. The Rhino is one of the best-sounding pedals of its type I have encountered in a long time and should be a front-runner for all you medium-gain rock and blues players out there. Something tells me one of these will end up on my pedal board sooner rather than later. Original Way Huge pedals made during the 1990’s by company founder Jeorge Tripps now sell for silly prices on eBay. Now that Jim Dunlop has brought them back into production (thus the Mk II designation), you can get one shiny and new for a much better price than you ever thought possible. 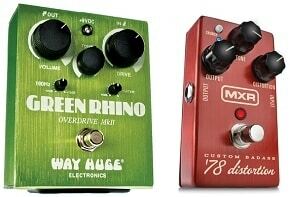 Both the MXR and Way Huge units are excellent choices for those seeking their own particular flavor of ragged glory. Which is the one for you? Only you can make that call, my friend, so saunter on down to your local Jim Dunlop dealer and heat them both up side-by side and see which one screams ‘Take me home!’ Keep watching this space for more gear reviews and videos from your friends at Gear Vault and Goodtime Music. Peace. IS A BOSS ME70 A GOOD GUITAR EFFECTS UNIT?